The Muncie Economic Development Oral Histories, also known as Muncie's Response to Economic Change: An Oral History, includes oral history interviews with local civic and business leaders involved in past and current efforts to address long-term economic change in Muncie and Delaware County, Indiana. 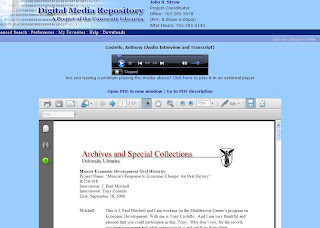 It is a subcollection of the larger Middletown Digital Oral History Collections, which is comprised of over 200 audio and corresponding transcript files embedded together on the same page. Embedding the PDF transcript was easy--that functionality comes standard with the latest version of CONTENTdm. However, we wanted to have the audio and transcript in the same window so that users could listen and read along at the same time. The resulting interface allows users to just that. Read Budi Wibowo's article on how to embed the audio player here on page 8 of Library Insider Vol. 6 Iss. 12. 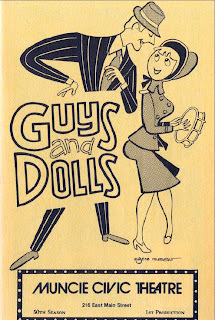 The Muncie Civic Theatre Programs Collection includes programs from plays presented by the Muncie Civic Theatre from its inception in 1931 through 1986, with additional programs from 1996 and 2005. View the collection here: http://libx.bsu.edu/collection.php?CISOROOT=/MunCiv. The programs were scanned in the Ball State University Libraries Digitization Center. Each was OCR processed, so the documents are fully searchable in the DMR and through Google. They were uploaded to the DMR in PDF format. Metadata records indicate the performance dates of each play. The BookDrive DIY book scanner is the latest addition to the University Libraries' Digitization Center. This book digitization solution was purchased as part of an LSTA Digitization Grant awarded to create a Middletown Women’s History Digital Collection. The collection contains several bound materials such as scrapbooks and diaries that we couldn't safely capture on a flatbed scanner. 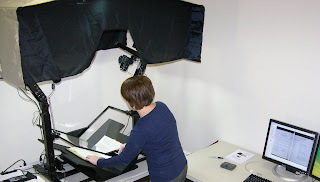 Due to the fragility and uniqueness of materials the collection, it was necessary to purchase a scanner that "cradles" the items, rather than stressing the bindings with traditional flatbed scanning. Digitization of bound materials began this week with minutes from the Community Woman’s Club Records, ca.1904-1955. We'll continue through the rest of the grant materials and move to other rare and historic bound items from Archives and Special Collections soon. We've enhanced Zoomify functionality in the DMR to include a "Save and Print" Feature. Sometimes when users view digital maps or other images, they're only interested in a certain section. Perhaps they locate the historical site where their home now sits, or they find a tiny town of particular research interest. In those cases, users might want to save or print just that zoomed portion instead of the entire map. The "Save" button lets users do just that -- by opening a new window that allows right-clicking to save, print, or email the zoomed image. 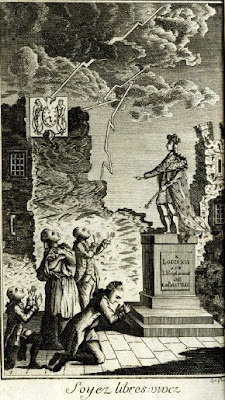 The Ball State University Libraries are pleased to announce the publication of the French Revolution Pamphlets Collection in the Digital Media Repository. This collection consists of French Revolution pamphlets ranging from 1779 to 1815. Although the French Revolution happened in the decade ranging from 1789 to 1799, this collection of pamphlets documents the time leading up to the revolution through the Napoleonic Wars (1799-1815). Often privately printed due to newspaper censure by the monarchy, the pamphlets were used to disseminate information and ideals concerning nationalism, citizenship, personal freedoms, and social injustice. The items were scanned, OCR'ed, packaged as PDFS, and uploaded to the Digital Media Repository. This collection is an example of CONTENTdm's embedded PDF interface, which allows quick scrolling, printing, and downloading of digital documents. Indiana Libraries Volume 27, Number 2 features "Bringing the Voices of Communities Together: The Middletown Digital Oral History Project" by Maren Read and Amanda Hurford. The article addresses the LSTA grant-funded project to digitize oral history collections from African American, Jewish and Catholic communities of Muncie, Indiana and make them available online in the Digital Media Repository. It explains the steps taken to complete the project, such as planning, training, digitization, transcription, metadata creation, online presentation. Anyone interested in a behind-the-scenes look at the DMR and those thinking about starting a digital oral history project now should find this article interesting. The latest collection added to the Digital Media Repository is the Joseph Fisher World War II Scrapbook. The collection consists of a scrapbook compiled by Fisher's mother containing letters, mementos, photographs, newspaper clippings, and inserts accompanying military allotment checks. This collection, like other digital scrapbooks, was a special challenge to present in the DMR. We wanted to show the structure of the book, while at the same time provide searchable information for each item therein. In order to accomplish that, the scrapbook is presented in it's entirety in item number one of the collection, followed by a separate record for each artifact. Stay tuned for Phase II of this collection, which should include an additional page-turning interface. 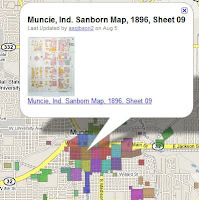 The Muncie Sanborn® Fire Insurance Map Collection now has an interactive twist! 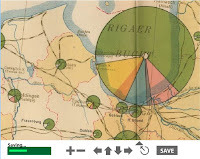 Using Google Maps, users can now easily visualize the locations shown on these maps from 1883-1911. Clicking on the colored sections of each zoomable map takes you to that digital record in the DMR. Thanks to members of Archives and Special Collections, GRMC, and LITS for making this useful tool available. Contact Angie Gibson, GIS Specialist, for more information. Recently added to the new DMR interface are several different ways to browse over 50 unique collections: A-Z, the default, shows thumbnail views from the collection. Subject/Geographic Area, Department, and Format all offer expandable and collapsable lists to organize the collections into logical categories. A cookie lets the DMR remember your preferred sorting method, and will open that view when you return, all making it easier for the you to find what you are looking for! The collection contains maps of the Ball State University in Muncie, Indiana starting in 1929-2000. These maps are a valuable resource for those interested in the growth of the Ball State University campus over the last century. 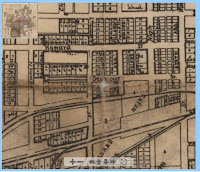 The maps are from the Geospatial Resources and Map Collection (GRMC) and Archives and Special Collections. This collection uses Zoomify technology. Did you know you can easily change the DMR results view? To quickly switch back and forth between the Thumbnail and the Grid View, use the Change View buttons in the center of the medium blue tool bar. Thumbnail View, the default, displays a small representative picture and the title for each item. The Thumbnail View is good for simple browsing. Click "Grid View" to view more information about each item, such as subject, description, or date. The Grid View allows you to gather more information and easily assess relevance before viewing the full item record. The Change View buttons are new customized enhancements to the DMR. You can still change the view option and other settings the old way, by going into "Preferences." Zoomify (http://www.zoomify.com/default.htm) is a piece of imaging technology new to the DMR. It allows users to view, zoom, and pan detailed images in a more quick and efficient way. The Muncie and Delaware County Historical Maps and Atlases Collection (http://libx.bsu.edu/collection.php?CISOROOT=/HistMaps), and the Sanborn® Fire Insurance Maps of Muncie, Indiana (http://libx.bsu.edu/collection.php?CISOROOT=/SanbrnMps) both feature this technology. When in a collection, just click the "Zoomify" button to be directed to the easy-zoom interface. Zoomify will soon be added to more DMR collections.